Obituary – Campbell, Freda Mae (Francis) « Perry High School Alumni Association, Inc.
Freda M. Campbell, 87, formerly of Perry, Oklahoma, was the daughter of Fred Wilford and Ella Mae (Holcomb) Francis. She was born January 21, 1925, in Marland, Oklahoma, and died Monday, October 15, 2012, at St. John’s Hospital in Tulsa, Oklahoma. Freda married Charles Campbell on August 16, 1943 in Norman, Oklahoma he preceded her in death on November 23, 1996. She enjoyed cooking, and gardening, especially flowers. Freda was a member of the First Christian Church in Perry, Oklahoma, The Petunia Garden Club, and The Ladies of 76 Homemaker Club. Freda enjoyed helping Charles on the farm and raising their cattle. Graveside Services will be private. Rev. Martin Foster will officiate. Services are under the direction of Brown-Dugger Funeral Home in Perry, Oklahoma. 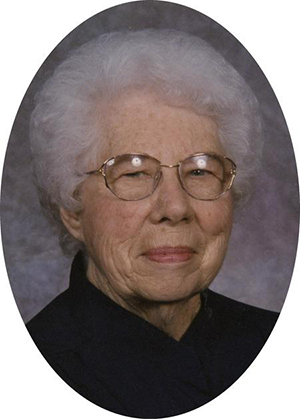 Freda is survived by two daughters, Mary Dickey and her husband Mike of Tulsa, Oklahoma, Pam Hill and her husband Bill of Guthrie, Oklahoma; three grandchildren, Justin Cross of Las Vegas, Nevada, Brent Campbell, and Mathew Dickey both of Tulsa, Oklahoma; two great-grandchildren Blake and Karleigh Cross of Las Vegas, Nevada. She was preceded in death by her parents and one brother Charles Francis.